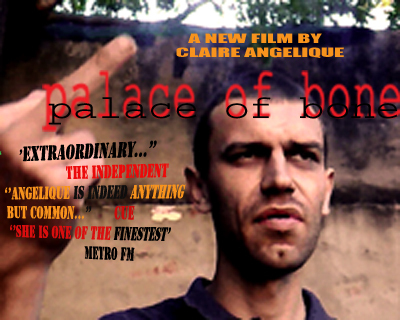 Claire Angelique, Standard Bank Young Artist of the Year for Film 2010, screens her Jhb premiere of her new feature film PALACE OF BONE on FRIDAY 5 AUGUST 7PM at the BIOSCOPE INDEPENDENT CINEMA, 6 FOX STREET (MAIN STREET LIFE) which showed to rave reviews at the recent National Arts Festival, Grahamstown 2011. PALACE of BONE, is the documentation over a couple of months of the strangely unstable day to day life of Faith – a scarred but brazen and quirky twenty five year old. Filmed entirely on cellular phones by her devoted best friend, the enigmatic Po, (who is rarely seen in front of the camera except in reflections, turning her back to Mecca…), we are allowed a voyeuristic peek into their friend’s squats, downtown bars and are privy to bedroom confessions. That is all until we realise that the ominous sequence of Faith’s actions due to likely severe psychological problems have forced Faith to escape the city and take to the hills. What we as an audience get to experience is Po’s last days with her comrade in the Palace of Bone; a euphemism for both the backstreets, backrooms and backdoors of the city of Durban and the cache of queer insights and outlooks of Faith, a girl who feels she is bigger than her world and thus has some rather unorthodox answers to curb her frustration. The film ends with us only sort of certain that Faith was last seen on August 15 2008, smoking a joint beside rusty train tracks north of Botha’s Hill. What we are certain of is that there are six dead bodies in Durban harbour….